Mouthguard Case is rated 4.4 out of 5 by 9. Rated 5 out of 5 by Jay Bern from Nice case Bought this for my son for football & he loves how nice the case is how well it allows "water" to get off a mouthguard and how easy it is to attach to either his helmet or gear bag. Now for the only small negative we've found. The "inexpensive" carabiner that's attached to the case for attachment to your gear bag or helmet has already bent and the clip doesn't clip any more. It would have been great if there had been foresight enough to make the carabiner replaceable. Really i'd like to give this a 4.5 to 4.75 star rating. 4 stars is to low and 5 star is just too high. 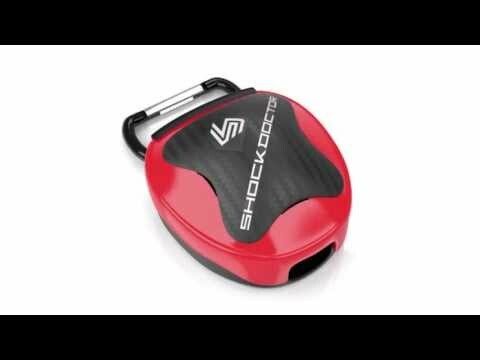 Rated 5 out of 5 by David P. from Shockdoctor Mouthgaurd Case Handy clip, plenty of room for any mouthgaurd size. Needs bright color options to make it easier for the kids to find in their hockey bags. Rated 5 out of 5 by Michele N. from So far it works great So far it works great my 11 year old says it fits well and not uncomfortable.